Why serve plain white rice with your meal when you can sneak in some veggies and a ton of flavor? I was originally going to make this dish a coconut (not) fried rice but then decided to make it a bit more simple and therefore more versatile. The only difference between it being a (not) fried rice and a pilaf is that I didn’t add an egg or any type of sauce. I decided to leave the “saucing” up to the individual eater. The pilaf makes a great bed for just about any Asian style meat. I’ve been piling my Teriyaki Pulled Pork on top and it makes a perfect sponge for all of the yummy gravy. It would also go great with Sriracha Chicken Strips or Coconut Chicken Strips. If you feel like eating a bowl on it’s own, make sure to sauce it up with a little soy sauce and a dab of sriracha sauce. I added both to the recipe costing because it really needs them if you’re not pairing it with another saucy dish. A little dribble of sesame oil would also be tasty! Fragrant jasmine rice, coconut milk, and vegetables come together to make this coconut rice pilaf full of flavor and texture! To make the coconut rice: Place the jasmine rice, garlic (minced), coconut milk, 2/3 cup of water and 1/2 tsp of salt into a pot. Stir to combine the ingredients. Place a lid on the pot and place over high heat until it comes to a boil. As soon as it comes to a full boil (watch closely) lower the heat to the lowest setting. Keeping the lid in place (don’t open it to peek!) and over low heat for 30 minutes. Turn the heat off after 30 minutes and let rest with the lid in place until you are ready to use the rice. Heat 2 Tbsp of olive oil over high heat in a large skillet. 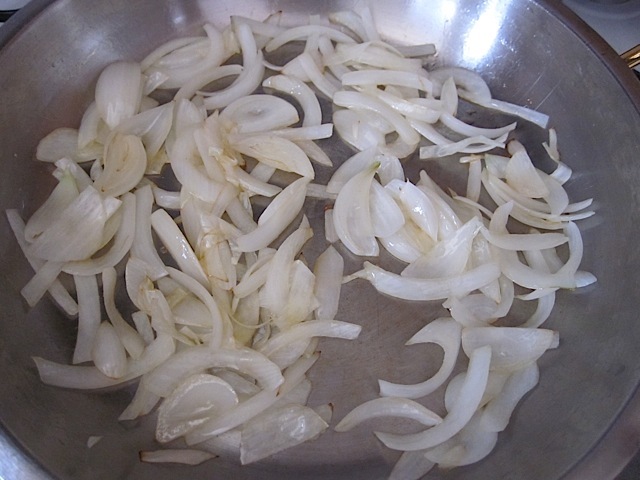 Slice the onions thinly and saute in the hot oil until they are golden brown on the edges. Add the frozen vegetables and saute until they have warmed through. Add the drained pineapple chunks and a pinch of salt and pepper. 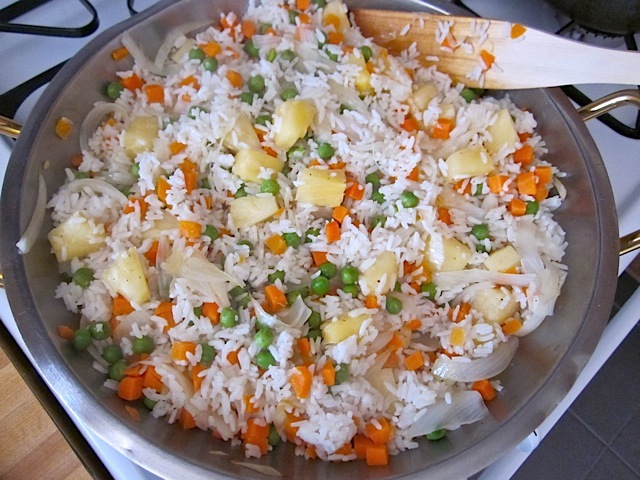 When the rice has finished cooking, fluff it with a fork and add it to the skillet with the vegetables. Turn the heat off under the skillet and stir to combine the ingredients. 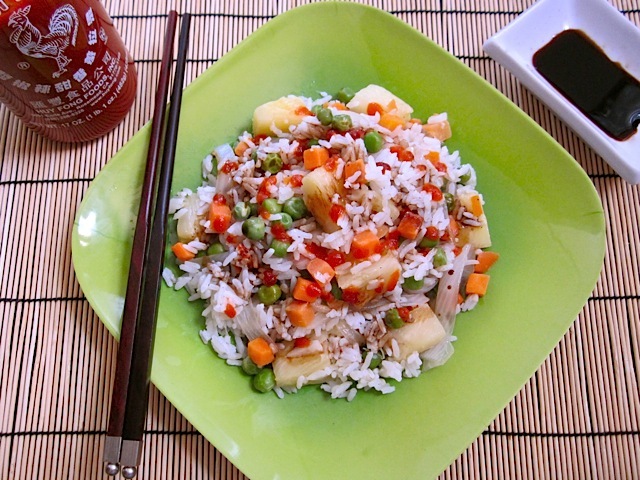 Serve the pilaf with soy sauce and sriracha! 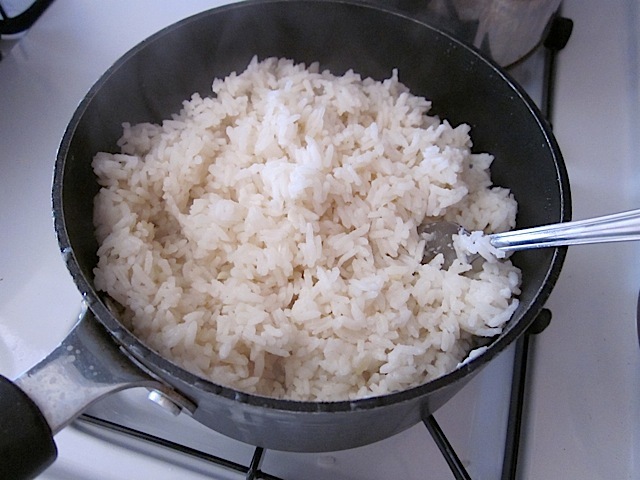 Place the rice, garlic, coconut milk, salt and 2/3 cup of water in a pot. Stir it all together, put a lid on it and bring to a boil over high heat. Reduce the heat to the lowest setting as soon as it begins to boil and leave it for 30 minutes. Turn the heat off and let it rest after 30 minutes. Saute the onions in olive oil over high heat until the edges are brown and crispy. 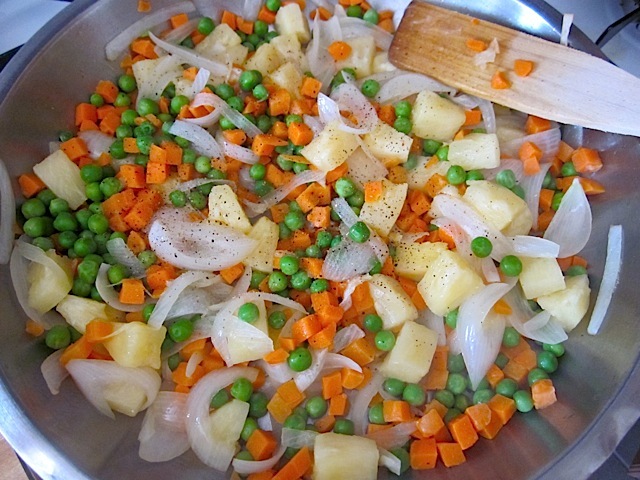 Add the frozen veggies and saute until they are warm. Then add the drained pineapple, a pinch of salt and pepper. Fluff the cooked rice with a fork. Try not to eat the entire pot of coconut rice before adding it to the recipe (This is where I failed). Turn the heat off of the skillet and stir in the rice. 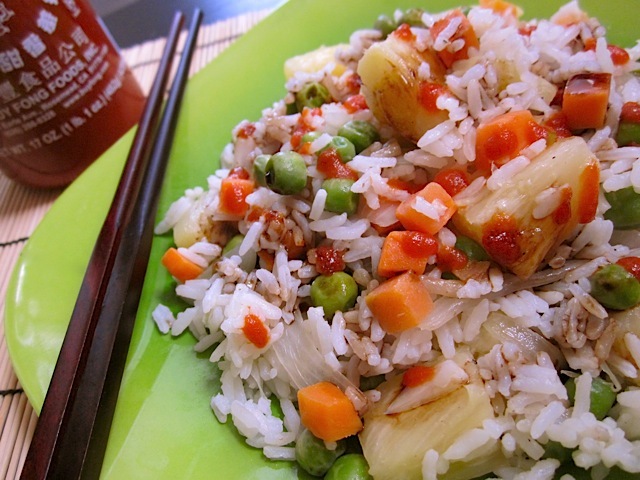 Top the pilaf with soy and sriracha! NOTE: Make sure to buy your jasmine rice out of the bulk bins or in a large bulk sized bag. Smaller bags of jasmine rice are usually marketed as “specialty rice” and cost about 3x as much as they should. Jasmine rice is essential to the flavor of this recipe so don’t skip it! I sure wish I had some cashews… the crunch and mild flavor would be outstanding in this pilaf!! This was not delicious at all. Maybe I tried to cook too much of it at once, as I tripled the recipe, but the coconut milk gelled with the rice and tasted unsavory. I will not be trying this again. I wish I could say this was good because I love pineapple coconut drinks. This was not good at all. I followed the directions but I must have messed up somewhere. It’s very bland. This recipe is one of my favorites. So easy and delicious. For the veggies we used a mixed bag with Lima beans, green beans, corn, and carrots and it was perfect. It served 3 very hungry people until we were stuffed and there’s still a little leftover. I’ve made this a few times, and it is simple and delicious, both with and without hot and/or soy sauce. I used fresh pineapple (it was on sale, frozen stir-fry veggies (since I’m not a huge fan of peas), and replaced sauteed onion with fresh green onions I added at the last minute with the pineapple. It was delicious with the ginger salmon! I just made this using a new rice cooker with steamer that I received for my birthday. I put the coconut milk in with the rice and steamed a bunch of veggies on top. I sauteed some tofu with garlic, onion, and the pineapples and then mixed it all together. Super tasty and beyond easy. I love this blog! Looks delicious! 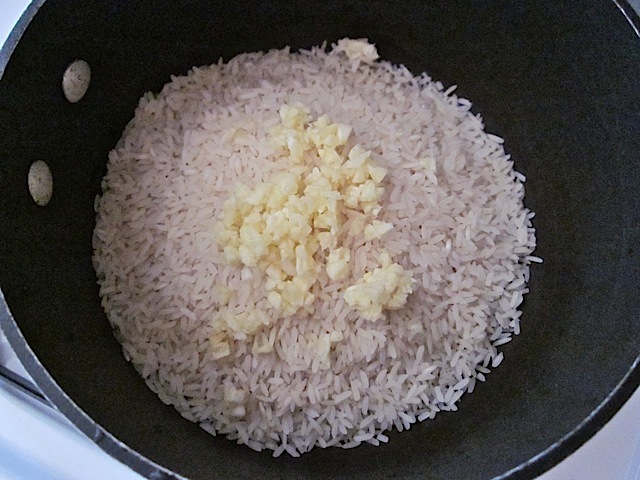 Can you use regular white rice instead of the jasmine? I love how quick and easy this was! It was super yummy doused in sweet chili sauce. Thanks! This was *so* good. The coconut reminds me of a method my Caribbean family uses so I wanted to try it. I ended up making a double-batch of the rice by accident (don’t ask). I added sauteed, marinated shrimp to the pilaf recipe and then put the remainder of the plain coconut rice in freezer for future use. The sriracha really does add something special to it! That looks absolutely amazing! I can’t wait to try it.